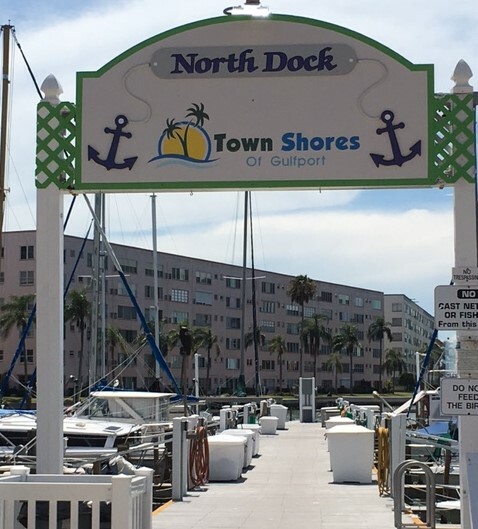 Look no further: move into this special and fantastic Waterfront Community *Town Shores of Gulfport* and better yet move in to this updated condo which is conveniently located on the first floor in the Jamison House. Step out the rear door and look to the left and what do you see *beautiful water* This Jamison Condo is also moments to one of the four pools in Town Shores, a 55+ waterfront community.This condo lives spaciously and features an open living room and dining area creating grand space for entertaining or simply peacefully relaxing. Check out the recently updated kitchen and bathroom – move in now!Room for your clothes in the large walk-in closet. Lots of natural light flows through this unit with a large window in the bedroom and living area. There’s plenty of storage in this unit with several closets available: pantry closet, linen closet, and utility closet. Step out the backdoor, turn left, and see the sparkling water!Enjoy this beautifully landscaped waterfront community with all the activities and recreation facilities it has to offer.This waterfront community offers boat docks, tennis courts, shuffleboard, bocce ball and community activities of every kind. The downtown area and historic section of Gulfport are just a short walk from your new condo.Gulfport is known for featuring fun events that you can walk to for your convenience. Community transportation is available right outside the complex.Enjoy a true Florida lifestyle in this ground floor unit.